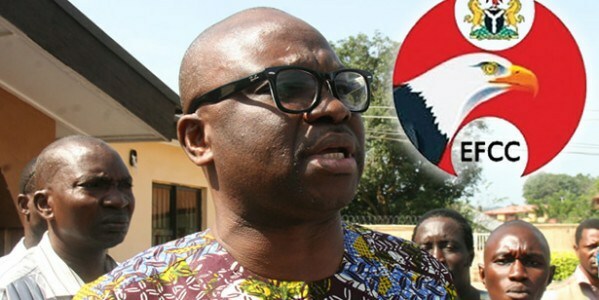 The Governor of Ekiti State, Mr. Ayodele Fayose, has accused the Economic and Financial Crimes Commission of hatred towards him and insisted that he would not appear before its officials for questioning before October 16. Fayose’s tenure will expire on October 15. The outgoing governor had earlier written to the commission that he would be available to answer questions from the operatives of the commission on the said date. However, the commission in its reply told the governor to make himself available on Thursday, September 20, 2018. But Fayose, in his reply on Tuesday, cited the danger of violating Section 308 of the 1999 Constitution (as amended) which vested immunity on him as a sitting governor. Fayose said he was moved to write the commission after reading in the media of its directive to the Nigeria Customs Service and immigration to arrest him on fears that he could run away from the country before the expiration of his tenure. In the letter addressed to acting Chairman of the EFCC, Mr. Ibrahim Magu, a copy of which was made available to journalists in Abuja on Tuesday, Fayose chided the commission for what he called the “unprovoked personal hatred and malice against my person”. The letter read in part, “I acknowledge the receipt of your letter dated 13th September 2018 requesting me to appear on the 20th September. “As a responsible citizen of the Federal Republic of Nigeria who currently enjoys immunity under Section 308 of the Constitution, it would amount to a breach of the Constitution which I swore to uphold if I appeared in your office on any date earlier than 16th October 2018. “If done otherwise, it will set a wrong precedent for the constitutional institution that I represent. “While drafting my response to yours of 14th September 2018, my attention was drawn to your widely publicised letter of 12th September 2018 to the Comptroller General, Nigeria Customs Service, and similar agencies, directing them to watch and arrest me on an imagination that I might leave Nigeria to escape investigation.